Ghatasthapana, also known as Kalashsthapana Puja, is performed on the first day of Navaratri and Dasain. 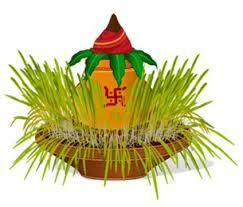 Ghatsthapana involves invoking Goddess Shakti in Kalash or Pot and symbolically on the growing shoots of grains. Ghatasthapana is performed mainly in Nepal during Dashain, North India during Navratri and in some parts of Bengal and eastern parts of Indiaduring Durga Puja. Here is a step by step guide on how to do or perform Ghatasthapana. Please note that this article only aims to give an idea of Ghatsthapana. You must be aware that Hindu rituals vary from region to region. How to perform Ghatasthapana Puja? Ghatasthapana is observed on the first day of Navratri – Pratipada day and is continued for the next nine days. The puja ends on the 10-th day morning of Vijaya Dasami or Dasara. Clean the puja room or area where you plan to perform the Ghatsthapana. Take a pitcher with large mouth made of mud or copper and fill it with soil and sow seven types of grains like barely, wheat etc. Nowadays people opt for single grain or lentil or gram. While sowing the grains mantras dedicated to Lord Varuna are chanted. If you do not know any Vedic mantras, you can use any mantra you know especially dedicated to Goddess Shakti. Bring another set of soil and make a thick square or rectangle bed with thickness of five or seven centimeters in the puja room or area. Grains are sown on this too. Photo of Goddess Durga or any other incarnation of Goddess Shakti is installed in the puja room or puja area near the thick square of sand bed. Navarna Yantra, if available, is installed near the picture of Goddess Durga. The pot with mud is installed along with the painting. A copper or silver or earthen pot is made to be the Kalash pot – fill it with water, sandalwood or paste, flowers, durva grass, rice mixed with turmeric (akshata), betel nut, five leaves, five gems or a gold coin. All these items are put into a single pot. A coconut is placed on top of the Kalash – some people avoid placing the coconut and instead use garland to cover the top. Garlands and flowers are placed on the pot, painting or idol. Flowers are placed near the pot and painting of Goddess. Morning and evening lamps are lit and Aarti is performed. In some houses a lamp remains lit for all the nine days. The mantras that are chanted during puja vary from region to region and vary with family tradition. Some people opt for simple Goddess Durga mantras. While offering Prasad, flowers etc the devotee says I offer flower (name of flower) to Goddess Durga or Shakti. Make sure that moist is maintained on the sand bed and in the pot with sand. For this slight amount of water is sprinkled. Fresh flowers and garland are offered on all the nine days. On the tenth day, the grains might have grown 3 inch or 5 inch and this is cut and given as Prasad to family members, friends and neighbors. While sowing grains, the mantra chanted is the one dedicated to Lord Varuna. But most people who are not aware of Vedic mantras opt for any of the popular prayers or mantras dedicated to Goddess Durga or any forms of Goddess Shakti. While performing puja, they say i offer flower (name of flower) to Goddess Durga. For Aarati any of the popular Goddess Durga bhajans or Navratri Bhajans are chanted.